Most regions are subclasses of SubRegion. Definition at line 435 of file MemRegion.h. Definition at line 441 of file MemRegion.h. Definition at line 460 of file MemRegion.h. 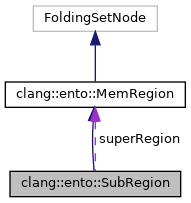 Reimplemented in clang::ento::FieldRegion, clang::ento::StringRegion, clang::ento::SymbolicRegion, clang::ento::TypedValueRegion, and clang::ento::AllocaRegion. Definition at line 452 of file MemRegion.h. Definition at line 145 of file MemRegion.cpp. Definition at line 447 of file MemRegion.h. Referenced by clang::ento::mpi::MPIChecker::checkDoubleNonblocking(), clang::ento::retaincountchecker::RetainCountChecker::checkPostStmt(), clang::ento::mpi::MPIChecker::checkUnmatchedWaits(), clang::ento::ElementRegion::getAsArrayOffset(), clang::ento::MemRegion::getDescriptiveName(), getMemRegionManager(), clang::ento::SValExplainer::VisitCXXBaseObjectRegion(), clang::ento::SValExplainer::VisitElementRegion(), clang::ento::SValExplainer::VisitFieldRegion(), and clang::ento::SValExplainer::VisitObjCIvarRegion(). Each region is a subregion of itself. Definition at line 132 of file MemRegion.cpp. Definition at line 439 of file MemRegion.h.